Deana had my curiousity. “The ops manager said he was afraid to show everyone what he was doing. But, now that the cat was out of the bag, he explained. He understood the sandbagging. He said each person on the team, and he called them by name, thought they were being sneaky by adding extra days to the project schedule, when, in fact, sometimes things go wrong and those extra days might be necessary. He called those extra days, buffers. “He showed us his secret project schedule where he took all the buffers away from each segment of the project and put them at the end. He was afraid that if people saw their buffers disappear, they would get mad at him, so he kept it a secret. “The schedule still had the buffer days, but they were all at the end. As the project went along, some of the buffer days were needed, so he would move only the necessary buffer days back to the segment. So, if a project segment went long, they still had buffer days. “When the last segment was completed, there were still eleven unused buffer days. Guess what that meant?” Deana teased. I just stared. Waiting for her discovery. “What was the most important lesson in all this?” I asked. This series has been an illustration of Basic Assumption Mental State, affectionately known as BAMs. The mental state of a group can shift in seconds. Teams can go into BAMs in a heartbeat, moving from Work into Non-work. It takes courage, and some skill to shift back into work mode. BAMs is most clearly defined in the book Experiences in Groups, by Wilfred Bion, brilliantly captured by Pat Murray and now by Eric Coryell in the stories they tell. Project buffers is a concept illustrated by Eli Goldratt in his book Critical Chain. This entry was posted in Teams and tagged non-work, project buffers, projects, teams, work on September 1, 2017 by Tom Foster. “What is different about the team, now?” I was curious. Deana tilted her head back, looking for the answer in the corner of the ceiling. “The team is in learning mode,” she said. “Are we back to that search for the truth?” I chuckled. “And, how did that go over?” I asked. “So, what was with the secret schedule?” I asked. This entry was posted in Teams and tagged non-work, pairing behavior, teams, work on August 30, 2017 by Tom Foster. “And, the ops manager spoke up,” Deana continued. “He said he was sorry he had been so defensive, and that he had been so secretive about the project schedule. “No one rolled their eyes at this point?” I smiled. “And what was the problem?” I asked. Deana had to think through the chain of events. “Part of it was persistence. I knew the problem was still there, we just couldn’t talk about it. But, I talked about it anyway. And you made me speak only for myself. This entry was posted in Teams and tagged BAMS, non-work, speak for yourself, teams, work on August 28, 2017 by Tom Foster. “How are they behaving?” I wanted to know. “So, what is causing the fatigue,” I asked. This entry was posted in Accountability, Culture and tagged culture, routine, work on September 21, 2015 by Tom Foster. “So, are they prescribing things for people to do, as a project leader?” Catherine asked. “Okay, I get it,” Catherine agreed. 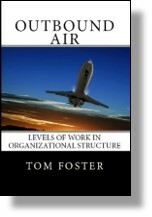 Excerpt from Outbound Air, Levels of Work in Organizational Structure, soon to be released in softcover and for Kindle. This entry was posted in Uncategorized and tagged auditor, cross-functional relationships, levels of work, manager, work on April 6, 2015 by Tom Foster.